Nice concept, however the cab ripped while trying to assemble. Also during wet snow, the snow sticks to the plastic windows. Had to keep clean off. 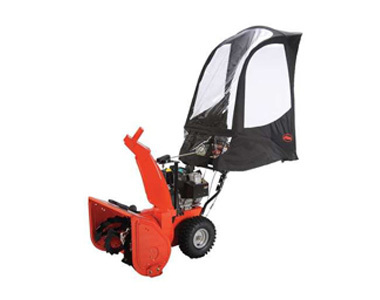 As well, the Ariens Compact 24 light reflects back into your face, obstructing your view. The cab kept falling backwards, although all screws were tightened. Not sure if this is by design, as it was still possible to use the cab by adding the extension bars. Ask us about the Ariens Deluxe Snow Blower Cab. Please no repair questions. Your Q&A may be posted to SnowblowersAtJacks.com to help other shoppers, like you, with their purchasing decisions. Thank you.